The author of this Sunday's New York Times magazine cover story about the campaign to boycott, divest, and sanction the state of Israel works for an organization whose major donor, Qatar, is also the largest state funder of the terrorist group Hamas. Other significant donors to the author's organization, the International Crisis Group, are leading supporters of the anti-Semitic boycott movement the author describes in his piece. The publication of the article, "How the Battle Over Israel and Anti-Semitism Is Fracturing American Politics," represents another salvo in the New York Times‘ continuing promotion of anti-Israel writers and views. The author, Nathan Thrall, is tied to a large network of BDS supporters that are funded into the millions by the Qatari government, which has long been engaged in efforts to spy on the American Jewish community and pro-Israel officials. Qatar's foreign influence operations in Washington, D.C., have flown mostly under the radar, but are part of a larger proxy battle being waged by wealthy Middle Eastern governments eager to peddle influence in powerful D.C. circles. Thrall, who the Times presents as a disinterested expert, serves as director of the Arab-Israeli Project at the International Crisis Group, or ICG, a left-leaning advocacy organization that has received around $4 million from the Qatari government in the just the last year. Qatar's donations represent around 6 percent of ICG's total budget. Qatar is not mentioned in Thrall's 11,500-word piece. Another significant portion of ICG's funding—more than $5 million in the last three years—comes from the Open Society Foundations, run by liberal billionaire George Soros. Open Society funds dozens of Palestinian organizations that are prominent members of the BDS movement. ICG's president is former Obama administration official Robert Malley, another Israel critic who was fired from President Barack Obama's 2008 presidential election team after he met with the Hamas terror organization. He joined the Obama administration in 2014. Thrall has been affiliated with ICG during the bulk of his career, which dates to 2010 with bylines at the BBC, the Guardian, the Washington Post, and CNN. In his writing, Thrall has gone to great lengths to portray Israel as an aggressor in its conflict with Palestinian terrorists. In a 2011 dispatch in the Times, Thrall argued that Israeli policies are to blame for the violence fostered by Hamas and its terror affiliates. Numerous other reports written over the years demonstrate a clear anti-Israel bias and attempt to portray the conflict as the Jewish state's fault, not that of the terrorists who attack it. As Hamas attacked Israel in 2014, Thrall wrote in the Times‘ Review of Books that the terror group "demonstrated that its militancy and its willingness to endure a ferocious Israeli attack could achieve more in weeks than [Palestinian President Mahmoud] Abbas's talks have achieved in years. During the Gaza war, Israel did not announce a single new settlement in the West Bank." In another 2014 report, Thrall wrote that Hamas's terrorist bombing on Israel are the "direct result of the choice by Israel and the West." Thrall has openly expressed support for the BDS movement, which he claimed is the "leading cause for advocates of free speech." Pro-Israel groups, Thrall has argued, are responsible for what he described as a "decades-long attempt" to "stifle pro-Palestinian speech in the U.S."
Thrall's advocacy with the Qatari-funded ICG is raising further questions about influence peddling by terror-tied governments. 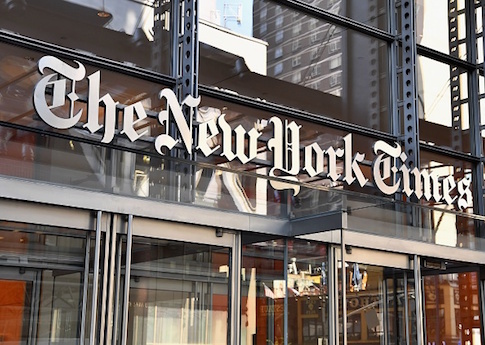 Critics argue that Thrall and the New York Times should disclose his ties and what appears to be a clear anti-Israel bias. David Brog, executive director of the Maccabee Task Force and former executive director of the Christians United For Israel, or CUFI told the Free Beacon that the article is clearly framed to portray Israel in an unflattering–and factually inaccurate–manner. "I didn't think it was possible, but the New York Times has reached a new low," Brog said. "This article is an extended, one-sided endorsement of Rep. Ilhan Omar's assertion that US support for Israel is purchased with Jewish dollars. To Thrall, Israel can do no right and the Palestinians can do no wrong. He condemns Israel's "occupation" while barely mentioning Israel's repeated offers to exit the territory — and the serial Palestinian rejections of these offers. He criticizes Israel's security measures without ever acknowledging the Palestinian terror that necessities them. He can't even bring himself to admit that the Palestinian Arabs launched the 1948 War in an effort to destroy Israel — he writes that the war "erupted." The list goes on. I'd expect more balanced and thorough reporting from a high school newspaper." Josh Block, a veteran pro-Israel official who serves as the CEO and president of the Israel Project, described the Times‘ failure to disclose Thrall's biases and ICG's funding as "horrifying." "It is outrageous that any newspaper, let alone one that takes itself so seriously as the NYT would commit what is such an obvious and horrifying violation of basic journalistic ethics and standards by publishing such a misleading article—presented as ‘news'—rife with falsehoods, ad hominem attacks on Jews and even including implying supporters of Israel were responsible for the Tree of Life massacre, all without acknowledging, even hiding the fact, that it is authored by a supporter of the ‘Destroy Israel Movement,' which calls itself B.D.S., and who is employed and paid by an organization whose primary funders are leading sponsors and funders of the effort to destroy and boycott the Jewish state, starting with Qatar, followed by the Rockefellers and OSI," Block said. "It boggles the mind. " This entry was posted in Culture and tagged New York Times. Bookmark the permalink.